, called in German Brenkwitz, a celebrated astronomer and mathematician, was born at Leisnig or Leipsic in Misnia, 1495, and made professor of mathematics at Ingolstadt in 1524, where he died in 1552, aged fifty-seven. 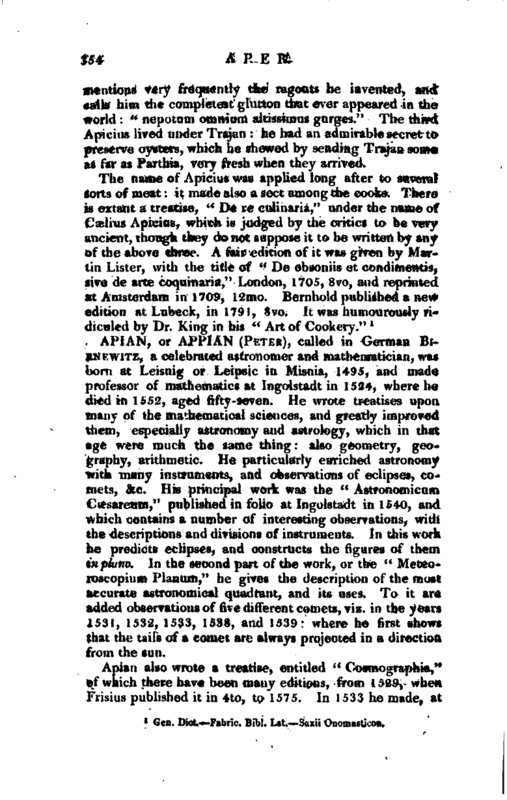 He wrote treatises upon many of the mathematical sciences, and greatly improved them, especially astronomy and astrology, which in that age were much the same thing: also geometry, geography, arithmetic. He particularly enriched astronomy with many instruments, and observations of eclipses, comets, &c. His principal work was the “Astronomicum Caesareum,” published in folio at Ingolstadt in 1540, and which contains a number of interesting observations, with the descriptions and divisions of instruments. In this work he predicts eclipses, and constructs the figures of them in piano. In the second part of the work, or the “Meteoroscopium Planum,” he gives the description of the most accurate astronomical quadrant, and its uses. To it are added observations of five different comets, viz. in the years 1531, 1532, 1533, 1538, and 1539: where he first shows that the tails of a comet are always projected in a direction from the sun. 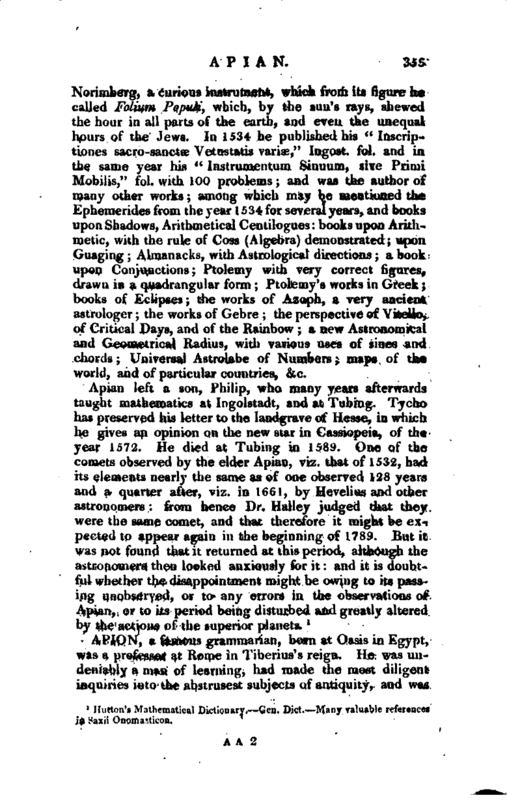 Apian also wrote a treatise, entitled “Cosmographia,” of which there have been many editions, from 1529, when Frisius published it in 4to, to 1575. In 1533 he made, at | Norimberg, a curious instrument, which from its figure he called Folium Poputi, which, by the sun’s rays, shewed the hour in all parts of the earth, and even the unequal hours of the Jews. In 1534 he published his “Inscriptiones sacro-sanctae Vetustatis variae,” Ingost. fol. and in the same year his “Instrumentum Sinuum, sive Prinii Mobilis,” fol. with 100 problems; and was the author of many other works; among which may be mentioned the Ephemerides from the year 1534 for several years, and books upon Shadows, Arithmetical Centilogues: books upon Arith metic, with the rule of Coss (Algebra) demonstrated; upon Guaging; Almanacks, with Astrological directions; a book vipon Conjunctions; Ptolemy with very correct figures, drawn in a quadrangular form; Ptolemy’s works in Greek; books of Eclipses; the works of Azoph, a very ancient astrologer; the works of Gebre; the perspective of Vitello, of Critical Days, and of the Rainbow; a new Astronomical and Geometrical Radius, with various uses of sines and chords; Universal Astrolabe of Numbers; maps of the world, and of particular countries, &c.
Hutton’s Mathematical Dictionary.—Gen. Dict.—Many valuable references in Saxii Onomasticon.